Lead abatement requirements apply only in states and Indian jurisdictions without any authorized lead abatement program. EPA has posted this information on its website which may be accessed by visiting the Lead Professionals page or contacting the National Lead Information Center (NLIC) at 1-800-424-LEAD. Building components: Spray a light drizzle over the area that will be removed. Remove the piece carefully and vacuum if necessary. Wrap the component in 6-mil plastic sheeting and seal with duct tape. Windows: After carefully removing the affected area, make sure there is not friction that can generate additional dust from other components that were not removed and that could have lead-based paint. Preferably remove all window components. Doors and jambs: After removing the lead-based paint affected the material, be sure to replace the jamb if possible. In some instances, this cannot be feasible so be sure to remove the stop and replace it with new material after stripping the old jamb. Kitchen cabinets: Remove the contaminated portion but be sure on not to remove additional lead-based paint in the walls. Metal components: Have them removed from the site and clean them off-site. Siding: Since this is exterior related work, then the area needs to be protected with plastic to avoid lead-based paint particles from getting loose. It is extremely important to follow federal regulations and provide the proper PPE to workers dedicated to this work. Enclosure: This can be the easiest of all methods. The lead paint is covered with a wall covering. This is typically done for large surfaces such as walls. Replacement: This method involves completely removing the door, window or molding that is covered in lead paint and replacing it with a new one. 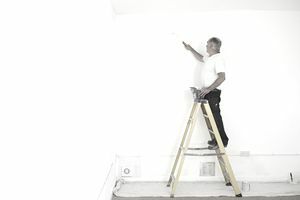 Paint removal: This method involves completely removing lead paint. This will create lead dust and should be performed by a certified professional. Encapsulation: This method not only covers but seals the affected area with a specific coating. This is less expensive but cannot be used on all surfaces. This record form can be used widely when performing lead abatement jobs.